Share the post "IFNH Partners with Mason Gross to Get Middle School Students Moving with Black Grace Dance Troupe"
Dancer from Black Grace (right) leads New Brunswick middle school students in dance movement. Dance can improve health through increased physical activity. This may seem like a simple concept, but it is not always obvious. 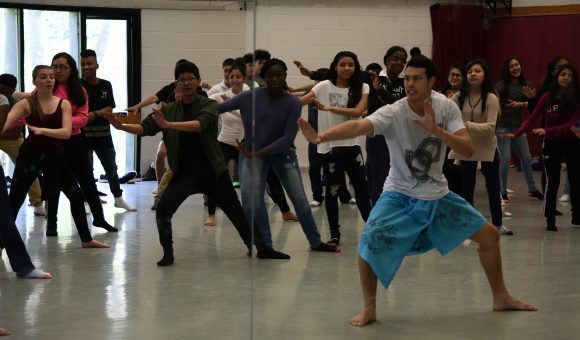 That connection was driven home this month when Rutgers brought a contemporary dance company, Black Grace, to the Greater New Brunswick Charter School. Through a joint program of the Center for Childhood Nutrition Education and Research and Center for Health and Human Performance at the New Jersey Institute for Food, Nutrition, and Health (IFNH) with the Mason Gross School of the Arts, students participated in a workshop with dancers from Black Grace to learn more about dance and how it can contribute to a healthy lifestyle. Doctoral student David Sanders from the IFNH Center for Health and Human Performance assists students with putting on heart monitors. 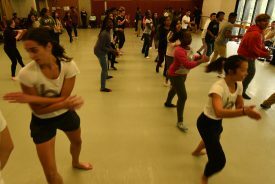 On April 20, the Dance Department and the IFNH Centers hosted a special workshop for New Brunswick middle school students, where Black Grace dancers taught their Pacific Fitness Master Class, which featured cultural dance styles and rhythms of the Pacific, with the aim to increase overall health and fitness while having fun. The middle school students experienced a combination of aerobic, strength and co-ordination exercises fused with Polyrhythms and swag. Daniel Hoffman, director of the center and associate professor of Nutritional Sciences, worked with Julia Ritter, chair, artistic director, and associate professor of the Dance Department for Mason Gross to develop a program where children were able to monitor their hearts in real-time to see how participating in the dance program raised their metabolism and learned the impact this kind of movement has on their health and fitness. Black Grace dancers (front, in white T-shirts) get students moving. “For most children, thinking about dance is an abstract concept and not normally linked to physical activity or fitness. We showed them exactly how much their heart rate increased when they danced and they learned that such activities can be fun and beneficial to their health, as much or more than many organized sports or gym routines,” said Hoffman. State Theatre and Rutgers University’s Mason Gross School of the Arts partnered with Black Grace on hosting two master classes. The master class participants included the middle school students from New Brunswick Charter School and Rutgers BFA dance majors. 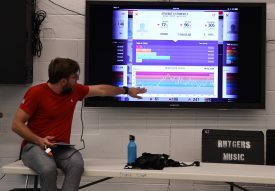 After the dance activities, Sanders showed the students the difference in their resting heart rate vs. their heart rate during the dance movements. Black Grace, one of New Zealand’s leading contemporary dance companies, performs a striking collection of short and full length works choreographed by founding artistic director Neil Ieremia. The work itself is highly physical, rich in the story telling traditions of the South Pacific, and expressed with raw finesse, unique beauty, and power. The company features some of New Zealand’s finest dancers and has toured internationally to Europe, Japan, South Korea, Mexico, Australia, and New Caledonia. Black Grace held a performance at the State Theatre in New Brunswick on April 21.